Cooking pigeon breast in a water bath ensures the cooking temperature can be strictly controlled, resulting in beautifully tender and moist meat every time. Cooking sous vide also ensures the flavour and nutrients are ‘locked in’, resulting in immensely flavourful meat. Sous vide enables ingredients to be cooked below 100°C – for this reason it often takes longer than a usual recipe. Food is sealed in an airtight bag and the heat from the surrounding water cooks the ingredient slowly and evenly. It is recommended to add salt and pepper to the meat before sealing the bag. Spices and herbs can come across stronger than they would in other cooking methods so use sparingly, cloves, star anise or a little curry powder would all work really well. 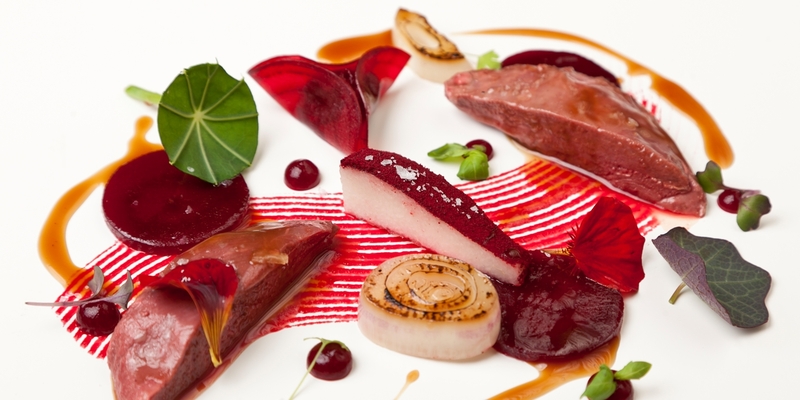 Colin McGurran uses just a small dash of flavoured oil and some fresh thyme to compliment the flavour of his sous vide pigeon with textures of beetroot, while Luke Holder adds a little olive oil, thyme and lardo to the bag to impart more flavour in his Pigeon with coffee cured foie gras.